A retired city bus in St. Louis, Missouri is turning into a mobile farmers market to sell groceries to the city’s food insecure. 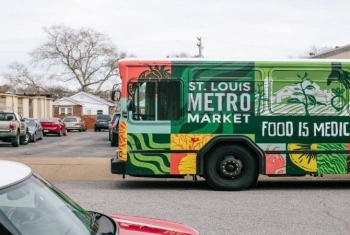 Known as the St. Louis MetroMarket, this mobile farmers market aims to increase access to healthy foods in low-income neighborhoods that don’t have grocery stores, often known as food deserts. The grocery store on wheels is set to launch at the end of May. St. Louis University medical student Jeremy Goss founded the nonprofit along with Washington University graduates Colin Dowling and Tej Azad. They’ve partnered with a local hospital to allow doctors to prescribe fruits and vegetables for children based on their level of hunger. They can then use that prescription as a coupon for the MetroMarket. Poor urban communities must often rely on fast food restaurants and convenience stores because of a dearth of supermarkets and grocery stores have few, healthy and affordable options. Some neighborhoods don’t receive adequate transit service, making the local grocery store is too expensive or far away. By treating food as medicine, they hope to help rectify the disparities faced by neighborhoods that lack grocery stores. In addition to groceries for sale, the bus will also provide cooking demonstrations and other resources for communities. “Our goal, in addition to providing immediate access to people in desperate need, is to advocate on their behalf on issues related to food, hunger, health and injustice. Because this is an issue of injustice,” Goss told KSDK. While the MetroMarket does rely on grants and donations, they will also be available to corporate customers to help offset the costs. Wealthier shoppers will be charged more to keep prices discounted for those who need it the most. More and more cities are exploring the idea of mobile farmers markets. In 2010, Toronto launched a program that converted old metro buses into mobile grocery stores called Mobile Good Food Markets. The mobile stores travel across Toronto to sell low-cost, fresh food in poor neighborhoods. In Washington DC, a similar concept using retired school buses brings local, sustainable produce to underserved communities. The addition of mobile farmers markets in cities throughout North America sends an important message about food access. Being poor should not limit a person to low quality and unhealthy food options. Regardless of where one lives, everyone deserves access to good food.